If your business email is posted online as a contact source, you want your potential customers to feel comfortable and secure with your business when contacting you. Are you using an email address branded to your business or something generic like @gmail, @aol? If your email address looks professional, your business looks professional. Imagine you’re in search of a life insurance company. With such a major investment at hand, you have have a few questions. Based on the company’s email address who would you feel comfortable going with info@eastlifeinvestments.com or eastlifeinvestments215@gmail.com? Personally, I’d choose info@eastlifeinvestments.com. Safe to say, most people would. According to a survey conducted by GoDaddy, 75% of U.S E-Commerce customers thought having a domain-based email address is a very important factor when it comes to trusting an online small business. 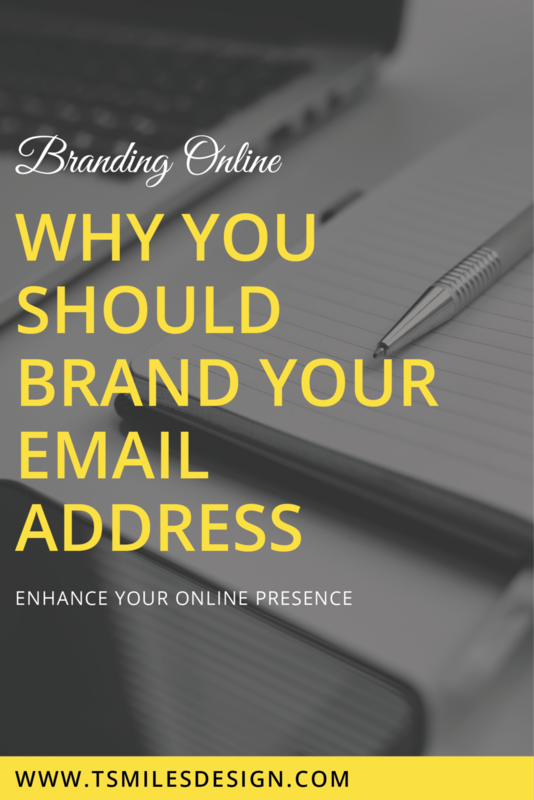 When including the branding elements of your business, your email address should be included. 1.) “You never get a second chance to make a first impression” First impressions count. If they didn’t then we’d be wearing jeans and sneakers to job interviews and business meetings. A generic email will give the impression that you’re not “that professional”. It causes doubt, it causes a potential client/customer to question how serious you are about your business. . 2.) You present experience within your market. To potential customers, you are TOO NEW: Most small businesses start out with a nonbranded email address, gmail, yahoo, aol, etc. Therefore, if a customer is looking to pursue your business they make think that you’re “too new”, still learning your way around and isn’t as knowledgable about the market. 3.) You gain trust and revenue. You’re online shopping and looking to make a big purchase but you have a question about the item. Would you feel more comfortable giving sally85@gmail.com or info@sallybeauties.com your credit card information? Info@sallybeauties.com sounds like a more reputable company therefore provides a sense of security and trust for E-Commerce customers. 4.) It’s affordable. Purchasing a domain-based email address is not as expensive as you may think. As long as you have a domain you can purchase a professional email address. I purchased mines through Google G Suite, which I love because it still implements with all my Google applications. Originally, it’s $5/month for Basic or $10 for Enhanced features, but I’ve provided a link that offers a 14 day free trial period and if you like it during your trial let me know. If you’re still using a generic email to contact your customers/clients, your first step should be to sign-up with Google G Suite to get started. You can try G Suite free for 14 days and see how you like it. When you're ready to purchase, shoot me an email and I'd provide a special discount code for your first year. If you already have a professional email, hats off to you!! The next step would be making sure you have a professional email signature. I’d share those steps in next week’s blog post. Leave a comment below. (I implemented Facebook Comments on my blog, so I'm super excited to use it lol).